. (1395). چکیده های عربی و انگلیسی. میقات حج, 25(97), 147-162.
. "چکیده های عربی و انگلیسی". میقات حج, 25, 97, 1395, 147-162.
. (1395). 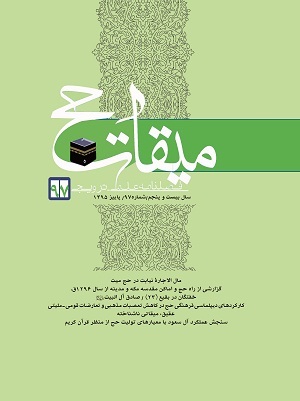 'چکیده های عربی و انگلیسی', میقات حج, 25(97), pp. 147-162.
. چکیده های عربی و انگلیسی. میقات حج, 1395; 25(97): 147-162. إذا أراد وصی أو وارث المیت إستئجار نائب لحجه فهناک صور متعددة لذلک وعلیه فإن تأمین مال الأجرة أیضاً تکون له صور متعددة. لذا إذا لم یوصِ المیت بالحج فهناک صورتان للمسألة ولو أوصى بالحج فهناک ثلاثة صور للمسألة ولو أن المیت نذر أن یؤدی مناسک الحج فی حیاته (الإحجاج) ولم یفِ بنذره فللمسألة أربعة صور. وتطرح هذه المسألة فی جمیع الصور الآنفة الذکر وهی أنّ مال أجرة النیابة هل یؤخذ من أصل مال المیت أو من ثلث ماله أو أنه لا من أصل المال ولا من ثلثه بل أن الوصی أو الوارث (الذی استناب عنه) علیه دفع الأجرة. الکلمات المفتاحیة: مال الأجرة، الأجرة، ثلث المال، أصل المال، النیابة، حج المنوب عنه، النائب، المیت، الوصیة، الوصی، الورثة. لم تظهر فیه دولة بهذا الاسم بعد، و ذلک بالإستعانة بعلم الغیب. و سیکون الإقبال على میقات وادی العقیق أکثر فی المستقبل نظراً لقوة بناءه فی منطقة «الضریبة». نرید القول فی هذا المقال الفقهی بعد التوضیح الدقیق لبدایة و نهایة مکان میقات العقیق أن میقات العقیق هو میقات الإحرام للحج و العمرة لجمیع الناس القادمة من الشرق. مفاتیح الکلمات: الحج، الإحرام، المیقات، العقیق، المسلخ، العراق. و الأحداث و الجریانات التابعة لأنظمة الظلم و الجور. حمى و أسند الحراکات التشکیلاتیة للشیعة وذلک بدرع التقیة. لکنه کان یشتکی من قلة الأنصار فی عین الکثرة الظاهریة لتلامذته. و قد أدى مخالفة نظام الخلافة لوجوده الطاهر إلى شهادته فی نهایة المطاف و لحوقه بآباءه الطاهرین فی سنة 148هـ و دفن جسده الطاهر فی البقیع الغرقد. مفاتیح الکلمات: صادق آل البیت، البشریة، التشیّع، الفقه، السیاسة، الإمامة، الشهادة. فی مکة و المدینة منذ عام1296هـ.ق. و المدینة؛ بحیث سترون أن هذا المتن من حیث احتواءه على بعض الجزئیات قد یسلط الضوء على بعض النکات اللطیفة عن أدبیات الحج و موضوع الأماکن المقدسة. مفاتیح الکلمات: اسماعیل المجاور، ساوجبلاغی، مکه، موصل، شام، جنة المعلاة، جبل ابوقبیس، جبل ثور، جبل النور، جدة، ایران. لا یشاهد أکثر هذه الموارد فی أداء الإدارة الفعلیة للحج. و عدم التطابق هذا مع المعاییر القرآنیة أدى إلى أن یلجأ قادة الأمة الإسلامیة و مفکریها للبحث عن حلول لإدارة الحج. هذه المقالة فی صدد المقارنة بین معاییر إدارة الحج القرآنیة و أداء آل سعود فی إدارة الحج. و تعتمد المقالة فی بیان الآراء على الطریقة الإستنادیة و فی بیان المحتوى على الطریقة التحلیلیة. مفاتیح الکلمات: الحج، بیت الله، معاییر الإدارة، السعودیة، القرآن الکریم. الهدف الأصلی من الدبلوماسیة الثقافیة هو الوصول إلى التفاهم المتقابل بربط الثقافات المختلفة ببعضها و تکوین العلاقات فیما بینها. العلاقات بین الناس البدائین کان غالباً ما یصاحبها النزاع و الشجار، لکن التعاملات و العلاقات الثقافیة الیوم قد تغیرت فی الدنیا من اللحاظ الکیفی والکمی واختلفت کثیراً عما کانت علیه فی السابق ومما لاشک فیه أن التطور العلمی ألقى بظله على نوع تعامل الناس و علاقاتهم ببعض. لذا للوصول إلى التفاهم الحقیقی یجب معرفة العوامل المؤثرة فی هذا المسیر أولاً وموانع الوصول إلى التفاهم المتقابل ورفعها ثانیاً. من جملة العوامل المؤثرة فی العلاقات الثقافیة هی إعتقادات الناس لأن أفکار الناس تتشکل عن طریق إعتقاداتهم و أعمالهم مستوحاة من أفکارهم فإذا صحت هذه المقدمات سنصل إلى العلاقات المطلوبة. و غیرها و التی تظهر فی موارد متعددة و تتسبب فی ظهور الهیمنة و التکبر. غالباً ما تنجر التعصبات إلى القومیة و الطائفیة فتکون عاملاً لکثیر من المنازعات التی تنتهی بتفکیک القومیات و الطوائف عن بعضها البعض و تسد باب الوصول إلى التفاهم و بالتالی الفصل بین الثقافات. من جملة الأهداف التی تنطوی علیها مناسک الحج محاربة التبعیض، التعصبات القومیة و غیرها و التی یمکن تحقیقها بالإلتفات لروح الحج و باطن أعماله و الأداء الصحیح لمناسکه. مفاتیح الکلمات: الحج، الدیبلوماسیة، الثقافة، التعصب. The expense of performing Haj on behalf of a deceased person. If the executor or heir of a deceased person wants somebody to perform haj on his behalf، various options are available، and there are different alternatives for covering the expenses of haj for each. Accordingly، if the deceased had not stated the performance of haj in his will، there are two possibilities; if he had willed it، there are three options that can be considered، and if he had made a vow (nadhr) to perform haj and was unable to fulfil it in his lifetime (Ihjaj)، there are four possibilities present. In each of these mentioned cases، it is said that the expense of asking someone to perform haj must be provided from the property of deceased، or from one-third of his wealth or، neither from his property nor from one-third of his wealth but it is upon the heir or the executor of the deceased to bear the cost of haj. Keywords: Expense، hiring، one-third of wealth، property، behalf، representative، deceased، will، executor، heir. The Miqat point of» Aqiq was designated for the inhabitants of Iraq by the Prophet (s) at a time when no such country even existed; he designated it through his knowledge of the unseen. Although the Miqat in the valley of «Aqiq is scarcely used in the present day، considering the structures constructed at al-Zaribah، it is presumed to come into greater use in the future. In the present jurisprudential work، by elucidating the starting and ending boundaries of» Aqiq، it is hoped that we can say that «Aqiq is a Miqat point for all the people who wish to travel for Haj and» Umrah from the eastern side. Similarly، if desired، the ihram is permissible from all three sides of «Aqiq namely، Maslakh، Ghamrah and Zat» Irq. The Infallibles (a) are like strong trees that have blossomed in the nurturing garden of Prophethood and have attained an incomparable brilliance. Sadiq Aal al-bayt is the axis of this brilliance; continuing to elucidate all aspects of religious law، he left no affair unattended and took upon himself the religious، political and ideological leadership of the Islamic nation. He was a decisive argument، a connected truthful، the designated Prophetic inheritance and a protector of the honour and position of the Ahl al-bayt (a) and proved the unmatched role of the Aal al-bayt. He had an eminent and unparalleled moral، spiritual، intellectual، political، and jurisprudential personality which was the reason why he was able to direct the Shi «a through difficult and critical historical times with great mastery، bearing many difficulties. He embodied generous attributes like being a forerunner in charitable activities، asceticism، God-consciousness، cognizance of great religious truths، getting along with people، among others. He represented all the collective attributes of great human beings and with these precious attainments، nurtured several students. He helped in the Shi» a jurisprudence reaching its high rank and successfully discharged the Islamic and Shi «a leadership with tact. He was a pioneer in undertaking strategic and foundational work، enlightening the position of Imamate in religious thought، creating a vast channel of religious propagation، illuminating deep human sciences، bringing about an ideological and political channel، and was an illumination against the enemies and agencies of oppression. He supported the structuring uprisings of the Shi» a in secret. He، in spite of having numerous students، however، complained of having few real friends، although it appeared that he had many. His opposition to the ruling government at the time finally led to his martyrdom in the year ۱۴۸ A. H as he joined his pure ancestors when his blessed body was buried in the Baqi «graveyard in Medinah. The Saudi kingdom «s unsuccessful role in the custodianship of the Kabah due to their not following Islamic standards and the clear verses of Quran has incited numerous challenges from and protests in the Muslim world. Some of the criteria for the custodians of Haj mentioned in the Quran are upholding God-consciousness، ability in creating or maintaining the pilgrims» safety، being steadfast in the custom of keeping clear of the polytheists and other Islamic rituals، fostering unity within the Muslim nation، paving the way for the hassle-free presence of the pilgrims for Haj، and safeguarding and strengthening the spirit of servitude which is one of the primary goals of Haj. Nevertheless، most of these characteristics are not found in the current administration of the custodians of Haj. The lack of the mentioned Quranic criteria in the operation of the Saudi kingdom has led to the intellectuals and leaders of the Islamic nation to think about a solution for the management of Haj. The present essay، while focussing on the verses of the Qur «an that elucidate the criteria for the custodians of Haj، seeks to compare the actions of the Saudi Kingdom in the administration of Haj with these very Quranic standards. Keywords: Haj، Kabah، criterion of custodianship، Saudi Arabia، Holy Quran. The primary goal of cultural diplomacy is reaching a reciprocal understanding of different cultural relations. The relations between primitive human beings was usually marked with conflicts and clashes. Today، cultural meetings with different people have quite a lot of difference as compared to the past. Without a doubt، increased awareness and a higher level of knowledge in human beings played an important role in this regard. Therefore، in order to reach a true understanding، growth promoting factors in this regard must be accurately identified and secondly، the barriers to reaching a reciprocal understanding must be identified and removed. Effective factors fostering cultural relations are basically the ideas and beliefs of the people because a person» s thinking and ideology are formed by his beliefs and his behaviour can also be set right through his ideology; and if these preliminaries are correct، relations will also be good and meaningful. One of the biggest obstacles in reaching a true understanding is prejudice that can arise from various domains like race، colour، language، sect، etc. and in effect creates snobbery and superiority. In many cases، prejudice leads to nationalism and tribalism which has caused many debates and disputes. This leads to nations to turn away from one another and closes the door to understanding and finally، causes different cultures to distance themselves from one another. The struggle against racism، discrimination، tribalism، etc. are goals that are embedded within the rituals of Haj which on close reflection upon its spirit and inner meanings، and by its correct performance، is possible to attain as intended. The writer has found a piece on the ritual of Haj and in order to form an integrated work، has included in it accounts surrounding the road to Haj and the holy places in Mecca and Medinah. The present account that was written in ۱۲۹۶ and ۱۲۹۷ A. H was authored by a fellow Sunni countryman who has، in view of highlighting the course of Haj، incorporated the characteristics of some cities، their distance from one another and the description of those holy places in Mecca and Medinah as deemed interesting to him. As the reader shall see، owing to the details mentioned in the writing، the present piece may add interesting aspects to the literature on Haj and other holy places.